The village of Massat, comprises 692 people and is situated at 650 meters of altitude. There are numerous shops, local art and services in the heart of the village where you can find local and regional products. During the course, many entertainments take place, such as the night market, local dancing, local game of bowling pin…There will also be a day dedicated to the discovery of the local heritage, chosen at your convenience : Saint-Girons market, the “Colporteurs” museum, the caves of Ker. The canton of Massat, retains a significant built heritage reflecting the intense activity that prevailed in the valleys in the past. You can discover the richness of this mountain built as different hikes and walks which we suggest to you : the beautiful summer pastures websites linking barns, cabins and orris dry stone, numerous hamlets and isolated dwellings and barns clinging to the mountain, the remains of mills and forges. 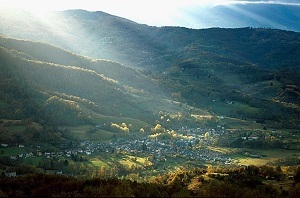 Where the Arac valley opens out, in the heart of the Pays Couserans and the regional parc, is where you can find the green vale of the canton of massat. 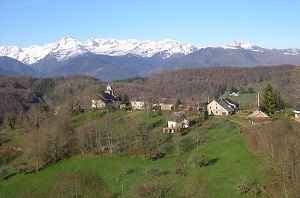 You will also be stunned by many cols such as the col de Port, de la Crouzette, du Saraillé, du Port de Lers, d’Agnès, and de Péguère which link Massat to the other vales of the department. Massat and the whereabouts : there are many outside activities to do, such as hiking, climbing, cycling, fishing, paragliding, horse riding…, some taking place in the preserved natural site of the Etang de Lers. You can also discover the richness of our vale : the “vestiges magdaléniens”, the old church of Massat of the XVIIth century with its tower high of 50 meters, the “Ave Maria Chapel” where the rehearsal will take place.